It’s been some time since we gathered an updated trend and data related to the developer’s estimated wages. If you’re considering a career path in technology, especially as a software developer, the first question that normally comes to your mind is: How much money developers make? There is a bunch of data to answer that question. According to Payscale, a Web Developer in Miami earns an average of $64k per year, and an entry-level developer earns an average of $51k in the same period. Web developers are one in a million right now. Sure, we know a lot of them, but the market can’t fill all their job vacancies. If you just make a quick search on Indeed and Glassdoor, there are currently more than 1k open positions for “web developers” only in Miami. And that’s just the two of them. The Bureau of Labor Statistics from the US Department of Labor predicts that from 2016 to 2026 software developer jobs will rise 302,500 from the 1,256,200 jobs existing in 2016. It’s not only about quantity but about quality. Software developers are capable of building apps, platforms, websites, programs, etc. The work environment, the organization culture, the field where you belong. There are several ways to achieve that status. Signing up for a coding Bootcamp can be a tough decision if you’re not well informed. The majority believes that college degrees are exactly what you need to get a professional job and earn six figures. If you check back our 2017 report, we’ve been gathering data on web developer’s salaries, just to help our students realize what they’re really worth in the job market. A well-rounded web developer that completes our Bootcamp has higher chances of getting a great job down the road. StackOverflow is a holy grail for developers. Every year they make a survey about developers, their habits, income, languages, etc. What better way to know where we stand than looking at it. Read the full report here. However, we have gathered here some of the important facts. Enrolling in a Bootcamp is a tricky decision. As they state, 82.7% of the developers surveyed learn to code asking questions and reading answers on the web. Seems illogical but keep in mind that many as 46.1% of them already have a degree. We truly believe coding Bootcamps are totally worth it. But it is a fact that many of them are self-taught. However, the time has come and Coding Bootcamps are still a recent upgrade to traditional education. If you want to learn in an effective, mentored, and coding environment, you have to join a Coding Bootcamp. Creating websites is still the main source of employment for developers. 74% of all the surveyed claimed to be employed full-time and 9.7% were independent, freelance or had their own business. Most Popular Technologies according to SO. Another interesting fact in the Hackerrank report is the most popular technology. While other technologies like blockchain have been overhyped to a pulp, the Internet of Things has opened up a very practical and logical path. Many developers working with that tech could benefit greatly from it. According to StackOverflow, the highest paid developer is an Engineering Manager, with an average salary of $89k, followed by a DevOps Specialist at $72k. A Data Science/Machine Learning Developer makes around $60k and a Full Stack Developer earns around $59k. Payscale offers a similar view. An average web developer salary ranks near the $59k mark. Glassdoor, on the other hand, puts web developers in the $65k area. Indeed is much more optimistic about it and for a developer in the US, an annual income can be on the $76k mark, with an hourly salary of $19.57 for entry level developers. Keep in mind the following: developers salaries vary between cities. As we stated before, Miami salaries tend to be on the lower side of that spectrum, given the cost of living and the number of startups and tech-related companies in the area. Payscale is offering some facts about gender behaviors in the market. 79% are male while 20% are female while 1% does not identify with either gender. The SO survey gives a more dramatic outtake, with a male developer population of 92.9% while the female is around 6.9%. Non-binary, genderqueer, or gender non-conforming is 0.9% of the population surveyed. There are no official reports on how gender may affect income balance, but the guess is that women and non-binary developers are making just as much as male developers. StackOverflow makes the difference between what men want in a developer job versus women and non-binary people. Man and women look for better salaries while non-binary people look first for a comprehensive workspace. What we know and teach to our students is that the thing that matters the most is mastering hard skills in order to get the position they need. Companies, startups, even individuals are looking for developers that can commit with the mandatory skills for the job; however, it is impossible to forget about soft skills, the ones that help us move forward and work in teams. All workplaces are looking for developers that not only meet with high coding skills but also lift a project with enough motivation and cooperation to make it work and grow. In today’s job market, tech skills are no longer just coding and building cool stuff: You need to find your place in a team. To be able to deliver a standing project, no developer can do it by themselves. Usually, there’s a lot of people involved in the same project to ensure its success. That’s the reason people skills, management skills, and soft skills, in general, are in demand. Soft skills also yield a better standpoint for developers in comprehending how their decisions influence businesses and customers needs. It’s hard to believe that a developer without any of these skills will perform well in a team, let alone make a project, brand or initiative stand out. Employers want to hire only the best and these soft skills, among many others, are key to perform well in the workplace. 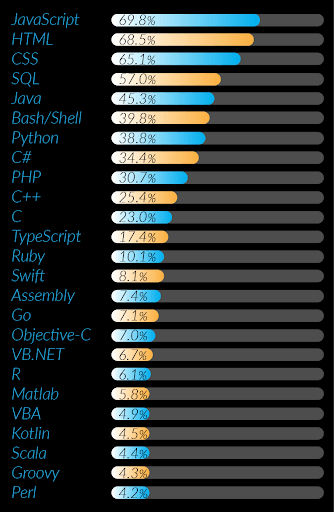 But there’s one technology that’s really standing out for developers: PYTHON. 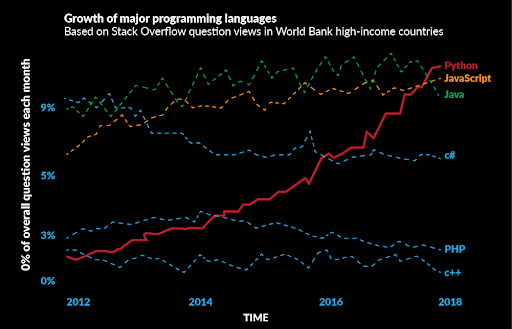 Python has become a really popular coding language, all over again. We would love to dwell on the reasons but the main focus is that AI, machine learning and Data Science, are the three biggest industries requiring developers to have experience or skills working with Python. Even SO states “Python has a solid claim to being the fastest-growing major programming language”. It’s easily the strongest career path for new developers and professionals that are looking for a new way to make their skills endure. Technologies, languages, and frameworks remain almost the same, with few changes, but the working conditions are the ones experiencing less change. Developer’s incomes have stabilized, with no dramatic changes. Web development is still -and will remain that way for a long time- a very lucrative career where you can grow and make others grow. You can land a job like this if you enroll in a coding Bootcamp. In less time than you can imagine, you’ll be fluent in coding languages that let you program the world around you. Enroll in one of our programs and start a career in the tech field. It’s not only about the money, but it’s also about what you are capable to build.